The Hieromartyr Athenogenes and his Ten Disciples suffered for Christ during the time of persecution against Christians in the city of Sebasteia. The governor Philomarchus made a large festival in honour of the pagan gods and summoned the Sebasteia citizenry to offer sacrifice to the idols. But the inhabitants of Sebasteia, Christian in the majority, refused to participate in the impious celebration with its offering of sacrifice to idols. Soldiers were ordered to kill people, and many Christians then accepted a martyr’s crown. It came to the governor’s attention, that Christianity was being widely spread about by the graced preaching of Bishop Athenogenes. Orders were issued to seek out the elder and arrest him. Saint Athenogenes and ten of his disciples lived not far from the city in a small monastery. But not finding the bishop there, the soldiers arrested his disciples. The governor gave orders to slap them into chains and throw them in prison. 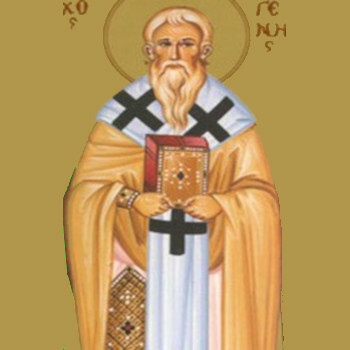 Saint Athenogenes came then to Sebasteia and began reproaching the judge that those thrown into prison were guiltless. He was arrested. In prison, Saint Athenogenes encouraged his spiritual children for their impending deed. Led forth to trial, all the holy martyrs confessed themselves Christians and refused to offer sacrifice to idols. After undergoing fierce tortures, the disciples of the holy bishop were beheaded. And after the execution of the disciples, the executioners were ordered to put the elder to the test of torture. Strengthened by the Lord, Saint Athenogenes underwent the tortures with dignity. His only request was that he be executed in the monastery. Taken to his own monastery, the saint in prayer gave thanks to God, and he rejoiced in the sufferings that he had undergone for Him. Saint Athenogenes besought of the Lord the forgiveness of sins of all those people, who should remember both him and his disciples. The Lord granted the saint to hear His Voice before death, announcing the promise given to the penitent thief: “Today with Me thou shalt be in paradise.” The hieromartyr himself bent his neck beneath the sword.